This wine shows intense and exuberant fruit. It's well balanced with lively acidity. 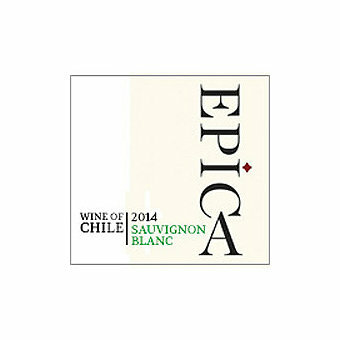 Epica Sauvignon Blanc blends grapes from the prestigious Curicó and Leyda Valleys, in order to produce a well-balanced and intense wine. Curicó lends notes of tropical fruits along with citrusy grapefruit notes, while Leyda delivers complexity and aromatic freshness. During each step of the winemaking process, Miguel Rencoret, Epica's Chief Winemaker preserves the aromatic potential of the grapes ending with a brief but important aging on its fine lees, in order to produce the most compelling Sauvignon Blanc possible. Rencoret learned his craft working for Viña Santa Rita, Viña Montes and Viña Caliterra in South America and the Robert Mondavi winery in Napa Valley. This wine shows intense and exuberant fruit; fresh tropical notes of passion fruit, mango, melon and citrus hints of grapefruit. It's well balanced with lively acidity.